The Intro to TRX bundle comes with the perfect mix of TRX gear and workouts to get anyone hooked on TRX — and going strong for a long time to come. 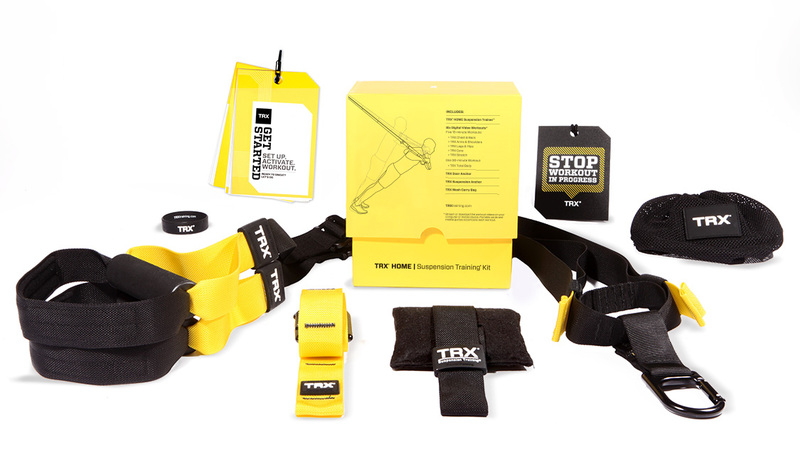 This stacked bundle contains the TRX HOME Suspension Training Kit including six, 15-30 – minute workouts to get you fit in the time you have. Take your strength and endurance up to the level of America’s highest echelon of fighting forces with the TRX FORCE Kit.Comes complete with a DVD and ruggedized guidebook, which comprises a 12-week progressive workout program. The TRX Rip Trainer employs an innovative resistance cord system to create a variable, unbalanced load that enables development of core strength, explosive power, flexibility and endurance through movement patterns related to everyday life and sport. The Essential Download Series comes with three hour-long, real-time workout downloads. Each workout focuses on a critical component for cultivating a well-rounded, healthy body and fitness that will last. Use the Essential Download series to develop and improve flexibility and strength while you burn fat. The Make Your Body Your Machine t-shirt is a quintessential, athletic-fitting shirt with a technical twist: a cotton-modal blend for reduced shrinkage and odor. Stays soft and keeps its color wash after wash. Made in the USA. The revolutionary new TRX FORCE Super App works on any smartphone to let you workout anywhere, any time. This is the ultra-enhanced digital version of the comprehensive, 12-week TRX Tactical Conditioning Program used in all branches of the US Military. The TRX suspension trainer is one of the most versatile ways to train your whole body. With the ability to train your core at all times as well as train being able to train in 3D you need guidance on correct technique and posture. When shopping for TRX gear, know that lower-cost options often mean lower quality. Learn more about where to buy TRX products, and how to alert us if you believe you’ve found a counterfeit.